Automobile retailing industries comprises of various companies and workers who are involved in purchasing the auto parts or vehicles in large quantities and selling it to the consumers in small portions. It is one of the profitable business with ample opportunities across the globe. Especially the globalization and improved economy of consumers have stimulated the growth of this industry to a greater extent. With so many opportunities in this segment, it is the right place to make your business deals. Hence if you have ever thought to tap into this area, Blue Mail Media helps you in this aspect. We understand your requirement and offer the best Automobile Retailers Mailing List that lets you reach key decision makers in this industry. 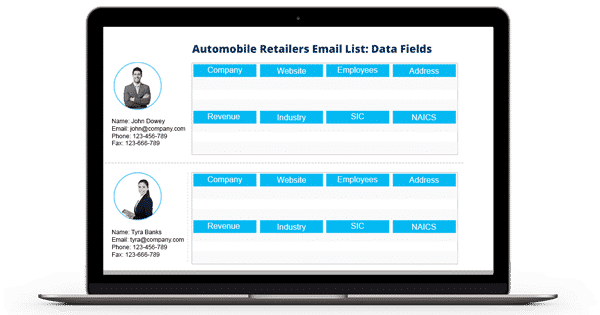 Blue Mail Media’s Automobile Retailers List is one of the highly reliable and accurate lists with all the essential B2B marketing information in it. We provide various data such as first name, last name, contact information, company details, and more to ease your job. Also, you can avail our list in either prepackaged or customized format. The data we collect here is from internationally trusted sources. It includes yellow pages, surveys, government records, business directories, conferences, trade shows, and many more. Our data analysts put rigorous effort to keep the list clean and free of errors. They make thousands of verification calls and send verification emails to ensure its accuracy. Also, we designed our Automobile Retailers Email Database to stay compliant with GDPR and Anti-Spam law. Hence you can trust the reliability of our list with no fear. With our list, you can arrange seamless interaction with the prospects outside your nation. That is, our Automobile Retailers Executives Mailing List covers the data of various regions worldwide. It includes North America, Europe, ASIA, Australia, New Zealand, Africa, the Middle East, and South America. Avail our list and see a drastic improvement in your sales figure and ROI.